Rockefeller’s on Washington was transformed on Sunday to the world of Blaze Foley, Broken Spoke mural, tequila sunrise’s to drink and all. Ethan Hawke, the film’s writer, director, and producer came swinging through town to introduce his new movie to the film community in Houston. He is doing the unheard of, he is premiering his film in Texas, not Los Angeles, not New York, but right here. 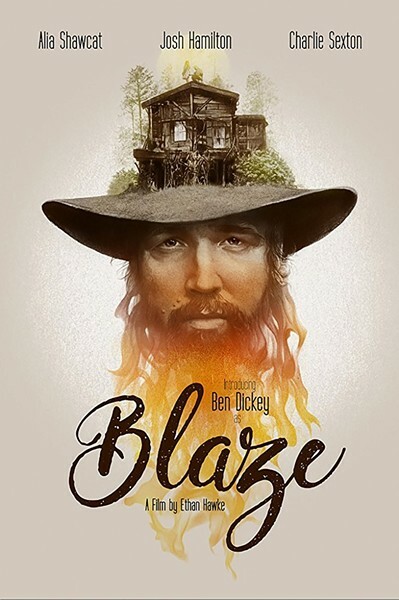 He decided to bring it first to the state he is from, where Blaze lived and died and where folks will understand the hot weather tempo of the film’s narrative and the heartfelt sloppy outsider, root country sound of its centerpiece Blaze Foley. The night was headlined by Grammy-winning singer-songwriter, musician Jack Ingram and the actor who plays Blaze in the film, experienced musician, first-time actor Ben Dickey. They opened with the song Clay Pigeons, which also opens the film. Incredibly, most of the songs from the film were recorded on set. You can hear birds chirping, boots drumming and the old wooden floors and bottles clinking in the background. After the concert set, there was a Q&A with the musicians and director. Ben Dickey had never acted before. He and Ethan are friends and when Ethan heard Ben’s band play he got the desire to see Ben play Blaze Foley in a film. Ethan couldn’t quite get a grasp on the story until he met Blaze’s love, Sybil Rosen. He read her book about the singer and her descriptions of him combined with Ethan’s concepts and ideas were enough to propel the project forward. Other musicians involved in the project include Charlie Sexton, Alynda Mariposa Segarra from the band Hurray for the Riff Raff among others. Writer, Director and Producer of the new film BLAZE at Rockefellers in Houston – August 12, 2018. The movie will have a staggered opening. It opens August 17th in select theaters in Texas amd them will be open nationwide in September. Next Houston: 1st Annual Lair Con! Image Comics, Makers Space, Cosplay & More!